Last weekend, Boyfriend got a new bicycle and we finally did our first ride together. We started at our house in Astoria and took the waterfront down to Long Island City, over the Pulaski Bridge into Greenpoint, and down to McCarren Park, which is the border area between Greenpoint and Williamsburg. Seeing Astoria by bicycle, in the summer especially, gives it an entirely different feel. 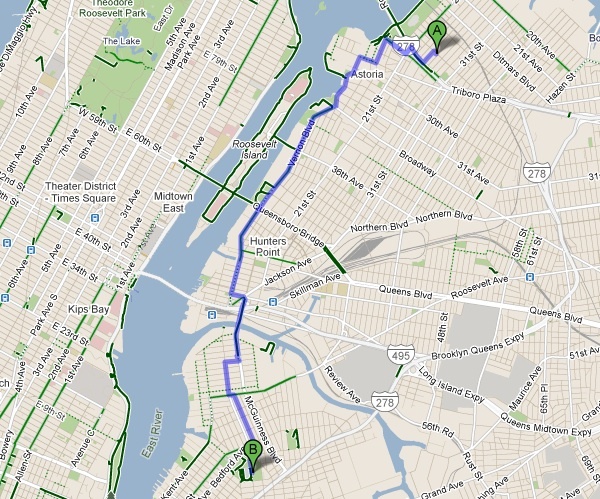 The Queen's side of the route runs along Vernon Blvd., with views of Manhattan and Roosevelt Island almost the entire way. Parks line the waterfront, too, with huge family gatherings and cookouts every weekend that leave you gliding through the wafting smoke of grilled meats and a gentle cloud of curry. Midway between Queens and Brooklyn is Socrates Sculpture Park. It's a strange park with modern and sometimes rather ugly sculptures, which change every year. When we first moved to Astoria, Boyfriend and I explored it once and decided that although we loved the view and some of the weirdness about the park, it just didn't warrant going back very often. So when we biked past the park last weekend and saw a new Astoria farmers' market had open, we finally had a real reason to return.